Recently the image below has been making the rounds as proof that conservative candidates, especially Ted Cruz, are dead in the water. The astute among you might notice that the totals only add up to 62%. When 38% of a poll is missing that can point to significant manipulation of the results. The tabulated poll results are hosted by the Suffolk University. As we suspect they tell a different story. The table below summarizes the data which is purported to be represented by the graphic above. Right away we notice a few things. There are a lot more people represented here than the eight in the graphic. There are more Undecideds than any other category. There are a lot of people here who are generally thought of to be conservative. The first point explains why the graphic percents only added up to 62%. We’ve found the missing 38%. The second point is very interesting. That group can swing any direction, but since they are likely Republican voters they should at least vote for the Republican candidate in the November elections. The third point is where we get into some interesting manipulation. If we look at the individual scores we would be tempted to say that conservatives are fairing poorly in New Hampshire. Two of the conservative darlings, Cruz and Paul only get a combined 6%. But as we consolidate the conservatives and the more main stream Republicans we get a different picture. Those generally considered to be conservative garner 30 to 37% (depending on who you include) of the respondents. Those generally considered to be main stream get roughly the same, once again depending on who you put in each category. 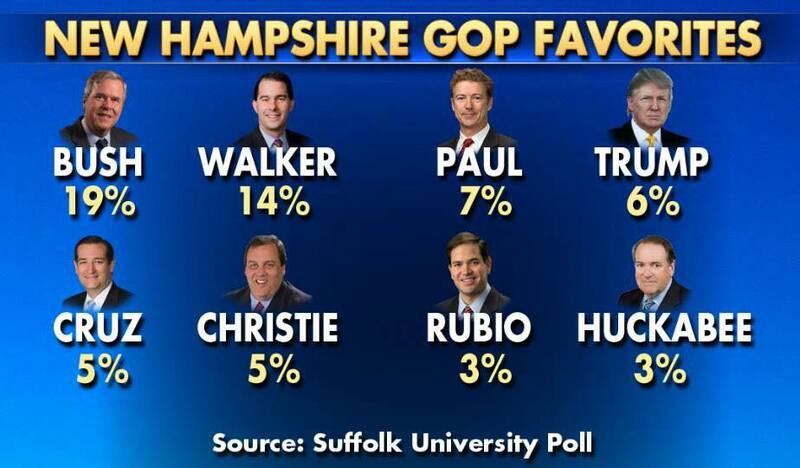 This means that conservatives are in a dead heat with main stream Republicans in New Hampshire. Given the name recognition that Jeb Bush has, this could be really bad news for the Bush campaign.